Haricot Vert is the French term for green beans. Generally haricot verts are thin, crisp and tender green beans, also known as "filet" green beans. You can easily grow them in your garden. Look for Maxibel bean seeds or the yellow bean called Soleil. What Is The Difference Between Pole Beans and Bush Beans? When you start growing green beans you first need to choose between those that grow on a bush, apply named "bush beans" and those that will need support or poles as they grow, which are called "pole beans." Almost all varieties of green beans are available in either pole or bush. There really is no difference between pole beans and bush beans, other than how they grow. Obviously pole beans are those which climb as they grow and bush beans are low growing bushes. One may fit into your garden architecture better than the other or you may prefer the look of one over another. 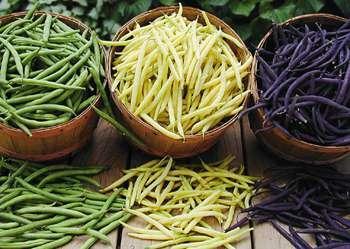 There are lots of different bush bean varieties for you to choose from. Some of the most popular are Blue Lake 274, Kentucky Wonder, Festiva and Burpee's Tenderpod. Some popular pole beans are Kentucky Blue, Kentucky Wonder and Blue Lake. Do Different Color Green Beans Taste Differently? Green beans come in some lovely colors that you'd never imagine. How about purple? Yes, that's right, purple. One purple variety of green bean is called Purple Podded, and it's a pole bean. There are also yellow green beans . Beurre de Rocquencourt are a variety of French Heirloom beans also known as yellow or wax beans. They can be cooked in the same way. Generally purple green beans and yellow green beans are identical in taste and texture to green green beans. One thing I'd like to add here are some cooking tips for purple green beans. A lot of home cooks take them home, boil them up and are very disappointed when the color bleeds out and they're left with green green beans. Once heat is applied to purple green beans they will loose their color. Most chef's agree the best way to cook them and have them retain their best color is to "butter baste" them. If you want to blanch them cookbook author Harold McGee book suggests you add a pinch of baking soda to the cooking water to help retain their color.